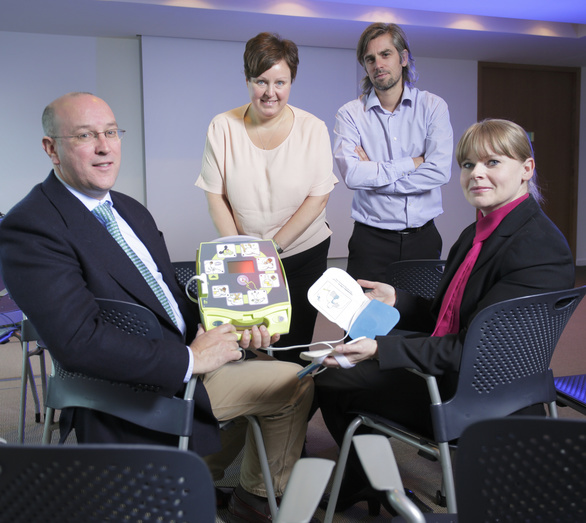 We are delighted to be backing European ‘Restart A Heart’ Day in conjunction with its building managing agents, CBRE, to invest in three life-saving specialist defibrillators. European ‘Restart A Heart’ Day is held annually on October 16th each year to raise awareness of cardiac arrests across Europe. The move was initiated when Corporate Partner, Andrew Davison attended a business dinner where Dr Michael Norton, a North East specialist in syncope and community cardiology, spoke about cardiac arrest and the importance of early CPR and early defibrillation with an AED. This led to Michael being asked to speak about CPR and AEDs to colleagues within Muckle during the firm’s annual Healthy Living Week. Dr. Michael Norton is a cardiologist in the north-east of England. Michael has a special interest in cardiac arrest and resuscitation and founded Cardioproof CIC, which is a not-for -profit organisation based in the north-east. Cardioproof’s aim is to improve survival from sudden cardiac arrest within our region and as part of this Cardioproof is working with a range of local organisations including companies, schools and local authorities to increase the number of people who can perform CPR and use an AED. We are the first law firm in the North East to have defibrillators on site for immediate use. Members of the team at the firm, including representatives from co-tenants, Brewin Dolphin and the on-site 24/7 security team, will now be trained by St. John Ambulance in giving cardiopulmonary resuscitation (CPR) and using the ZOLL AED Plus defibrillators which could restart the heart of someone who suffers a cardiac arrest. The three ZOLL AED Plus defibrillators, are being purchased for the use of all businesses within the Time Central building, monitors and guides the rescuer to achieve the correct rate and depth of chest compressions during CPR. They are safe and easy to use, with sensors monitoring the patient that enable the machine to instruct the user what to do, step by step. Christine Stephenson, co-founder of North East Hearts with Goals, a charity set up to place lifesaving defibrillators into public places, added: “We have placed nearly 150 defibrillators throughout the North East and we are absolutely thrilled to hear Muckle LLP have been so proactive in safeguarding its people and clients by installing three defibrillators at its offices in the city centre. Sudden cardiac arrest kills 100,000 people in the UK every year and a defibrillator deployed within the first few minutes is absolutely crucial for a fighting chance at survival. Every minute that passes without defibrillation decreases someone’s chances by 10%. We have also helped a North East school, Bridgewater Primary School, by making a donation from its community fund to buy a life saving defibrillator. For more information on how we are implementing AED’s please contact Andrew Davison on 0191 211 7950.